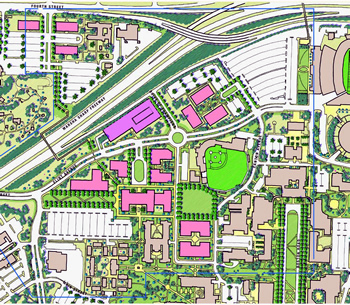 This study guides development of the North Gateway Precinct on Texas Tech University’s Lubbock campus. The study creates an open space system and sites new academic buildings, the first of which will be the College of Business Administration. 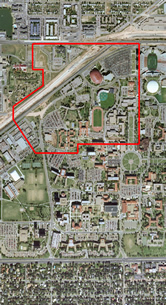 The proposed open space system emulates that found in the historic core of Texas Tech University. It creates both north and east entries; the latter is restricted to pedestrians. The plan includes a major new multipurpose quad, while building clusters frame internal courtyards. To promote increased pedestrian vitality and an efficient use of land, the precinct plan proposes development densities higher than typically found in the historic core of campus. This is accomplished by locating buildings closer to pedestrian paths and allowing increased building heights, up to four stories.